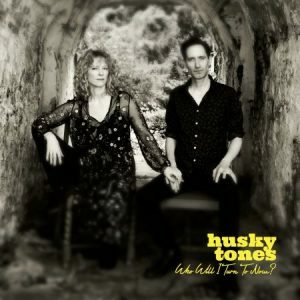 Husky Tones – Who Will I Turn To Now? Who Will I Turn To Now? is the second album from Husky Tones, an English duo comprising Victoria Bourne on vocals and drums and Chris Harper on guitar. Their debut album, Time For A Change, was encouragingly reviewed in Blues Blast in March 2016. On the live circuit, they have a growing reputation for what they describe as their “punk blues”. In the studio, they take advantage of technology to overdub additional guitars and voices to fill out the sound. The punk influence in Husky Tones’ music is easily discernible in the relatively simplistic chord structures of the songs and the anger and rage of some of the playing, as well as in the overtly political lyrics and the general absence of solos. Lyrically, Husky Tones address a range of broad societal issues, from the protest march celebrations of “Momentum”, to the attacks on the UK’s benefits system in “Who Will I Turn To Now?” and the bleak prospects for the victims of the current refugee crisis in “Jungle Blues”. “Jungle Blues” itself starts off with some acoustic finger-picking reminiscent of Skip James before picking up the pace with a series of multi-tracked guitars and voices. Acoustic guitar also features in “The Island Of Barbed Wire”, a lovely folk ballad that tells the true story of Bourne’s great uncle who was from originally from Germany and found himself interned on the Isle of Man by the British authorities during the First World War. The majority of songs however favour the electric guitar over the acoustic. Musically, Harper is an impressive guitarist, covering finger-picking, electric single note riffs, wah-wah’ed licks and simple yet subtle chords. What is not so clear is where Bourne and Harper think the blues can be found in the “punk blues” of their album. There are certainly hints of blues in some of the tracks (as in the opening of “Jungle Blues”) but there is significantly more folk influence than blues (see “Put Your Arms Around Someone You Love”) and the band’s primary influence, at least on the evidence of Who Will I Turn To Now?, appears to be the heavy rock of Led Zeppelin – perhaps somewhat surprisingly, given that the entire punk movement was inspired by what was at the time perceived as the over-blown grandiosity and self-obsession of bands such as Zeppelin. Bourne’s airy soprano vocals weave melodies that are reminiscent of Robert Plant’s own melodies, especially in the way the voice may not obviously follow the underlying music. Further, a number of songs (such as “One Good Reason” or upbeat love song that is “These Hips Were Made For You”) feature changes of riffs and time signatures that again recall Led Zeppelin (albeit without the overwhelming virtuosity of Plant, Page, Jones and Bonham). The opening track, “Round The Wrekin” is perhaps the prime example of this, opening with a droning one chord guitar over which repeated short electric guitar licks are laid. As the intensity of the song builds, the chorus is built around a single note riff that Jimmy Page would love to have written. Further riffs are introduced as the song develops, always returning to the one chord drone, dynamically raising and lowering the energy and ferocity throughout. Who Will I Turn To Now? is an entertaining album that suggests there is a lot of potential in Husky Tones and you will want to check it out if you love Led Zeppelin. Be aware however that you won’t find very much blues in evidence. CategoriesAlbum Reviews TagsBlues Rock, Chris Harper, English native, Husky Tones, Led Zeppelin, Punk Blues, Rhys Williams, Rock, Victoria Bourne, Who Will I Turn To Now?